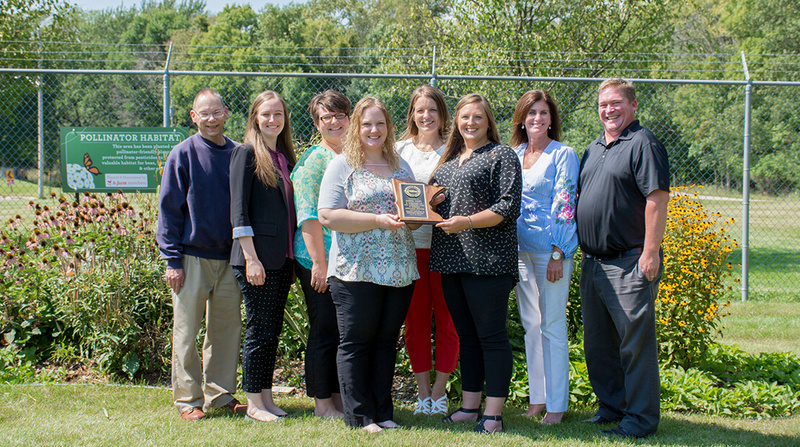 Hormel Foods was recently recognized by the Minnesota Association of Agriculture Educators (MAAE) for efforts to promote and support agricultural education in Minnesota classrooms. The company was nominated for the award by a local high school agriculture teacher, and the H-FARM (Hormel Food and Agriculture Resource Members) employee resource group coordinated the application and received the award on behalf of the company. Hormel Foods has been involved in many events throughout the years supporting agricultural education and FFA, an intra-curricular student organization focusing on agriculture and leadership. Some of the support has included being present at the Minnesota and Iowa state FFA conventions as well as the national convention, team members serving as judges for contests and volunteers for events, and being a sponsor of the national organization for almost 50 years. In addition to participating at various events, H-FARM is in the process of aligning Hormel Foods team members with the Austin (Minn.) high school agriculture and FFA programs and working to identify and schedule opportunities for in-classroom collaboration with students. Volunteers spend time working with students based on their areas of expertise, industry knowledge and classroom curriculum. As the group learns from piloting in Austin, the hope is to expand this opportunity to other schools with agriculture and FFA programs. The award was presented at the annual conference of MAAE. The MAAE is an organization of teachers of agriculture at the high school, post-secondary and adult levels who seek to advance agricultural education in Minnesota.